1) Waking to the sound of my baby girl in her crib next door and feeding her before getting ready to leave for my race. What a quiet house! 2) Running a personal best and capturing first female at the Burlington Robbie Burns 8 km in 27:43. 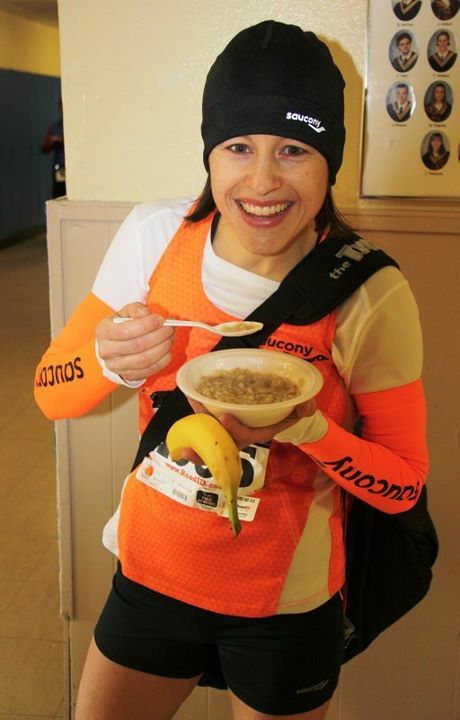 3) Enjoying emend, porridge, and a hot shower right after my race. I tell you, this race is one of my favourites because of the porridge and showers! Check out the picture take by Alan Brookes. 4) Coming home to my amazing husband and 3 sweet kids. 5) Eating a few olives and salmon with a spinach salad (maple syrup, olive oil, balsam. vinegar and garlic dressing of course) for dinner. 6) Drinking a non-fat Starbucks mocha (my treat to myself after a good race), a bit of red wine w/ dinner, and later tonight a cup of tea w/ lots of milk and a little bit of peanut butter brownie. 7) Spending the afternoon and evening w/ my family. I am thrilled to have 2 personal best times so far in 2012 (10 km and 8 km). Hopefully I’ll keep up with this in my upcoming races! Set the bar high! There is no other way. So, this song came into my head when I read the title of your post (oh, and CONGRATS, BTW!!) The closest you and "Maria" get to your "favourite things" is, I think, "crisp apple streudels".